A common dish in our diets is a shiitake burger. When I was at the store cremini mushrooms were on sale for $1.49 per 8oz package as opposed to the normal $4.99. Shiitakes also typically cost about $4.99 per 8oz package. So, I decided to use creminis. To make the patties I small diced a quarter of a medium-sized onion, two garlic cloves minced, about 5 or 6 oz’s of creminis diced, and about a pound of ground beef. 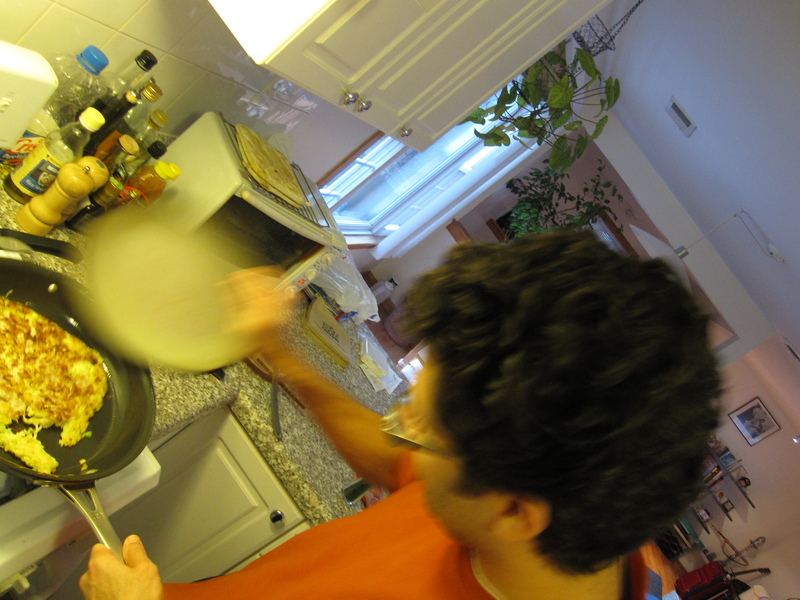 To that, I mixed in a half teaspoon of mirin, 1 teaspoon of sake, 1.5 teaspoons of sake, and one egg all beaten together. I don’t typically like to put egg in my burgers, but I didn’t have any bread crumbs or any bread to make breadcrumbs and I was a little worried that the added liquids would make the meat too loose. Once everything was mixed up I let it rest for about fifteen minutes. Then, I made it into 4 patties and put them in the fridge, covered, until just before grilling time. I made some soup to serve with the burgers. I put about 3 cups of water in a pan and turned the heat up. I added about 8 chopped green onions, one chopped carrot, the rest of the creminis sliced, and let that all boil for about 7 minutes. 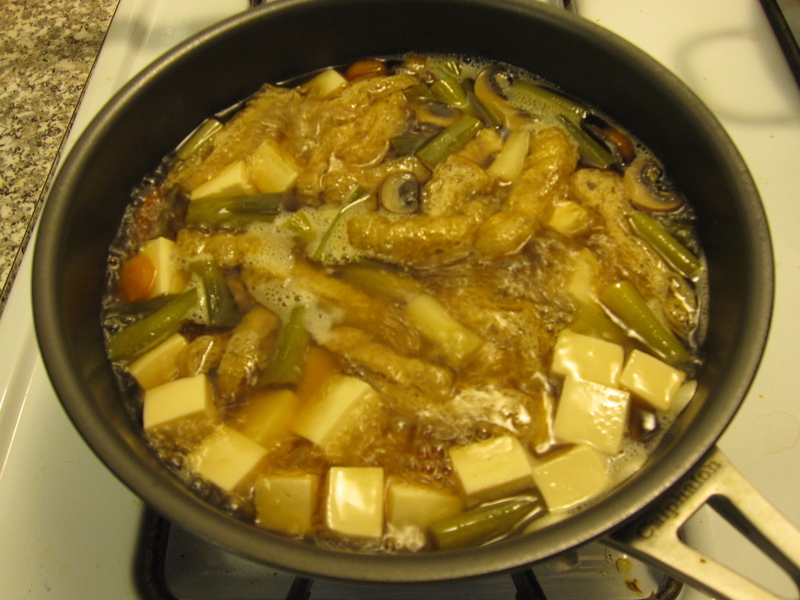 Then I added a tablespoon of instant dashi and about a quarter cup of soy sauce. Once that all mixed in I added some sliced aburage and a half block of silken tofu that I diced. I let that simmer a little and then covered it and turned the heat down to keep it warm while I grilled. I first grilled some broccoli and orange bell pepper slices (both drizzled with olive oil, salt, and pepper) over direct heat on the top rack until the broccoli started to show some grill marks. Then I moved the broccoli to the other side of the grill off the direct heat so that it would continue to cook a little without burning. After the broccoli was moved I put the burgers on the lower rack and grilled them up. 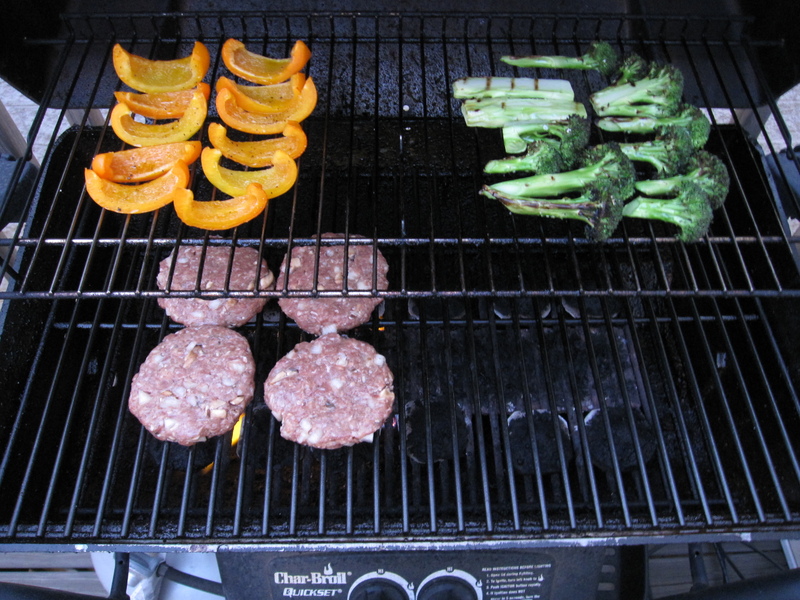 By the time the burgers were done on both sides the peppers were nice and roasted and the broccoli nice and al dente. I served everything with white rice. 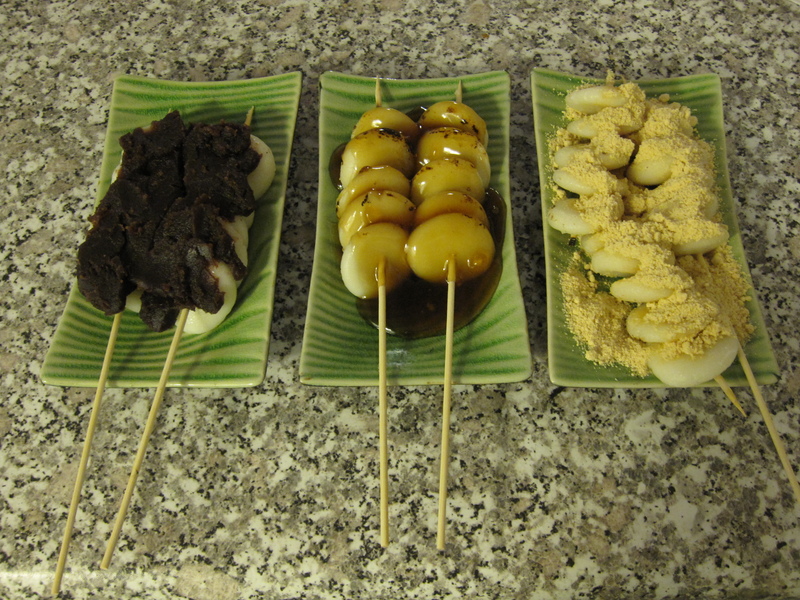 I also drizzled a little ponzu on top of the burgers to add a little zing to them. 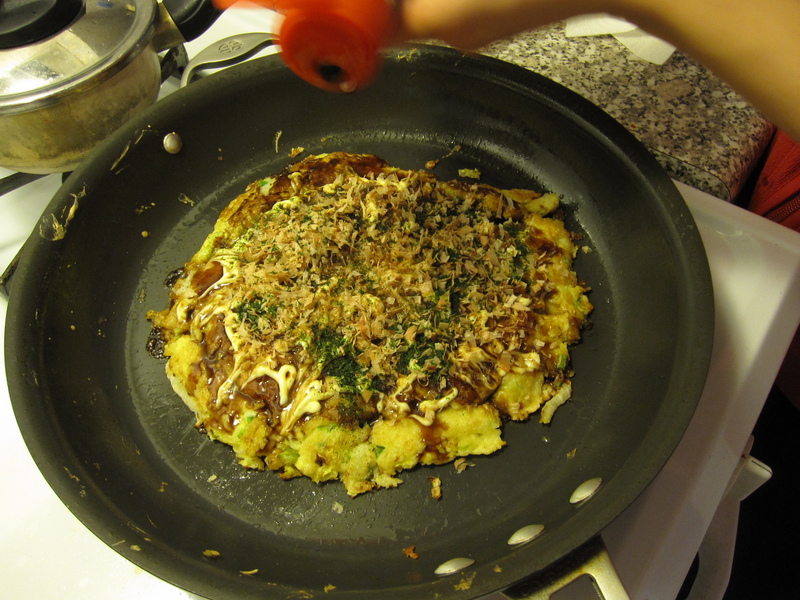 Last night we made Okonomiyaki for dinner. Well, Yuki made it, I was her sous chef. She also made a Korean spiced soup to get more vegetables into the meal. That and she loves soup. To start off she cooked thin slices of Kurobuta Pork that we got at Mitsuwa in a little sesame oil. Any pork will do as long as it’s thinly sliced. You can also bacon or any bacon-like substance. Or, no meat at all. 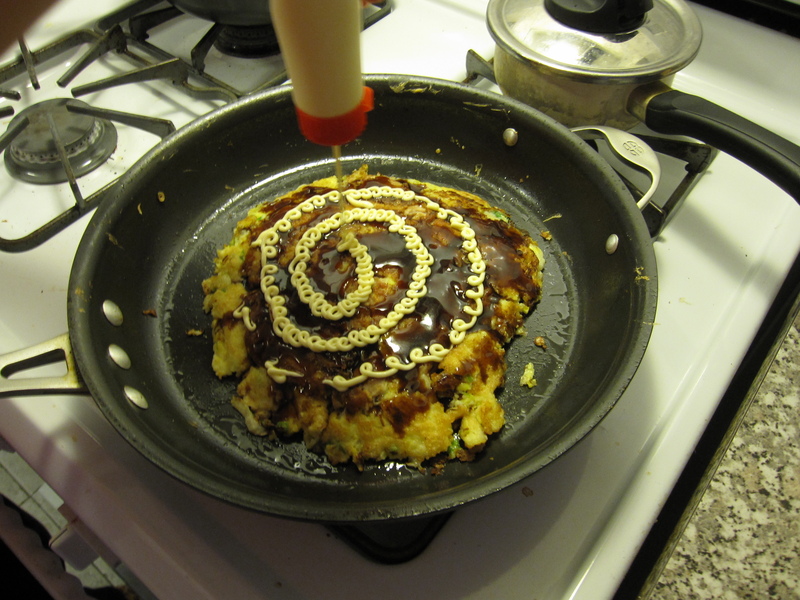 Then, she poured the batter on top to make a pancake. I’m not real sure what kind of flour she used, we have a few different kinds on our pantry, but all-purpose will do, about a cup. She mixed it with about 3/4 cup water and a couple of eggs. 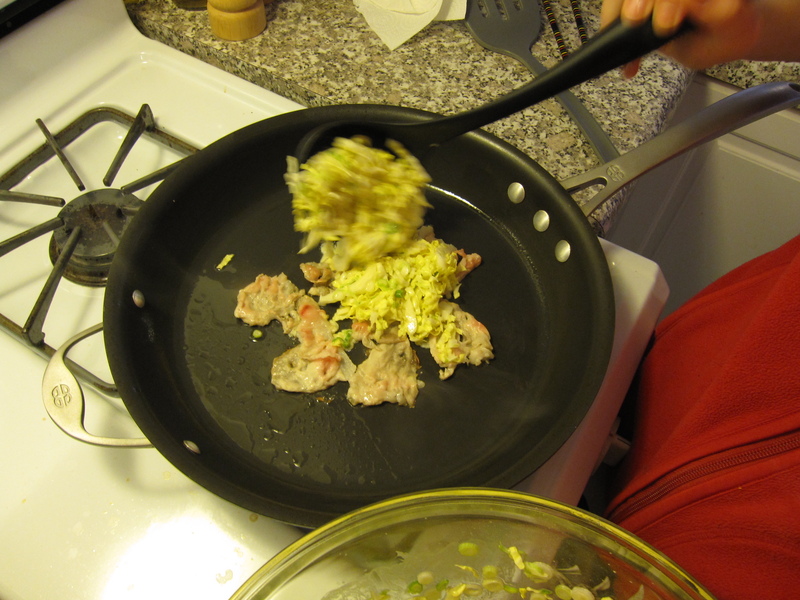 Then she mixed in a bunch of thinly sliced green onions and a cup of thinly sliced Napa Cabbage. Instead of making 4 smaller ones, we made two big ones. I had to use a plate to get that thing flipped over when it was time to cook the other side. It’s ready to flip when the bottom is a nice golden brown color. While the bottom is cooking you pour the on top. First pour on Bulldog Sauce. 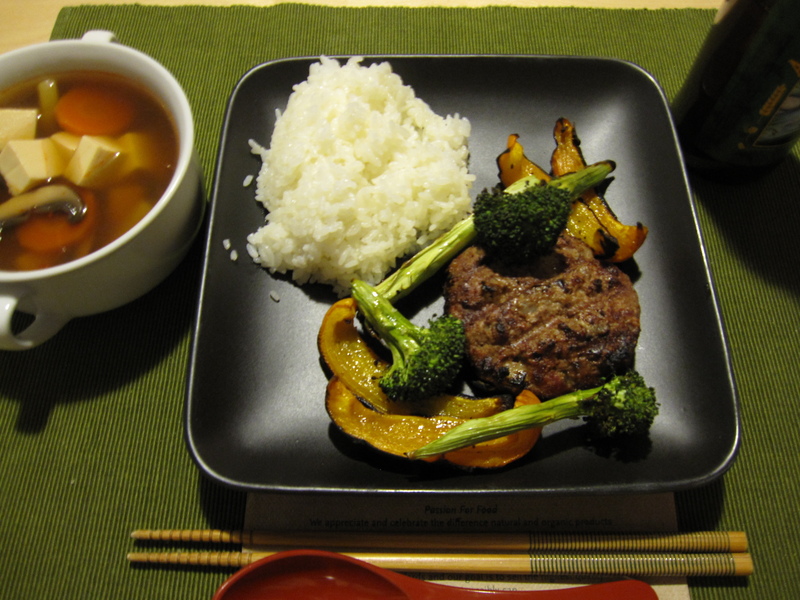 A popular sauce in Japan commonly used on Tonkatsu, fried pork cutlet. Then squeeze on some mayonnaise. 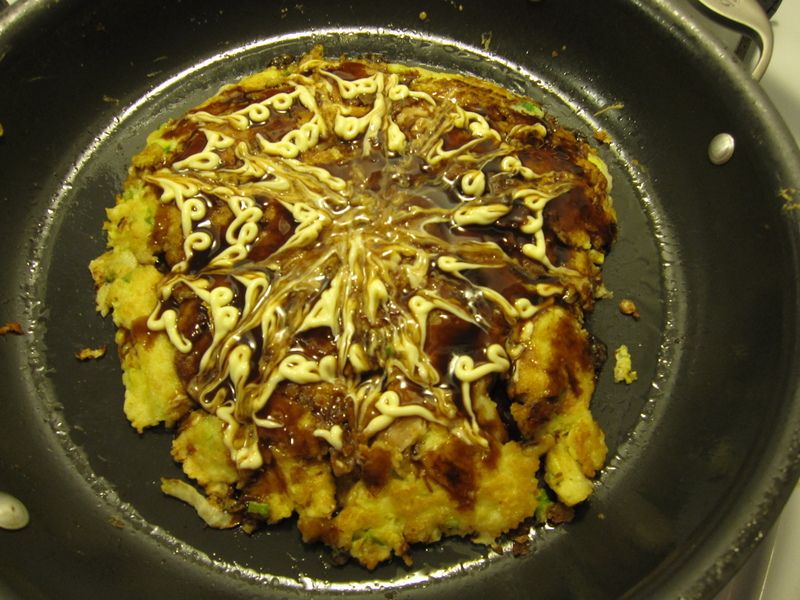 Feel free to paint your okonomiyaki with the sauces. 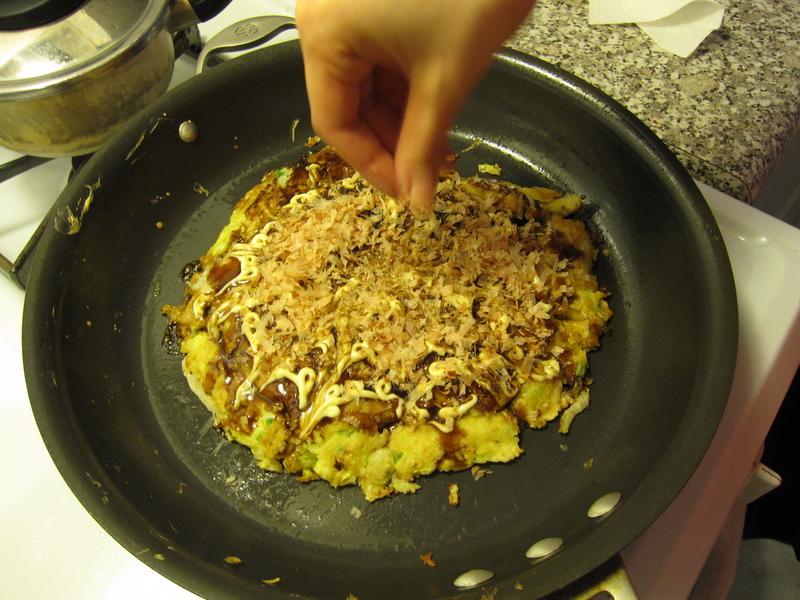 Then top it with a bunch of katsuo-bushi, dried bonito flakes. Finally, top it off with some ao-nori, ground seaweed. For the soup, Yuki started by boiling some light dashi broth. She added some green onions, thinly sliced carrot, enoki mushrooms, aburage, broccoli, komatsuna (Japanese Mustard Spinach), and small diced tofu. 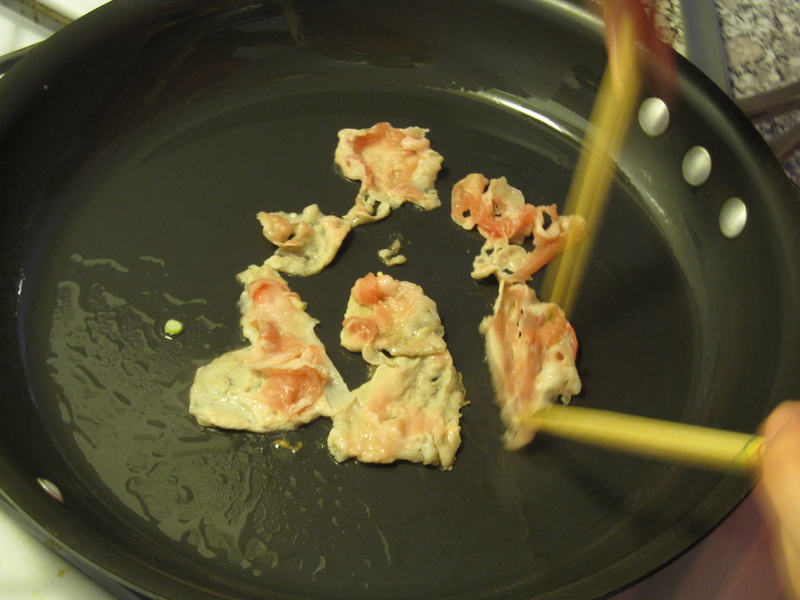 Once everything was cooked she swirled in a couple of tablespoons of tobanjan paste (Korean hot chili paste). It was that simple. 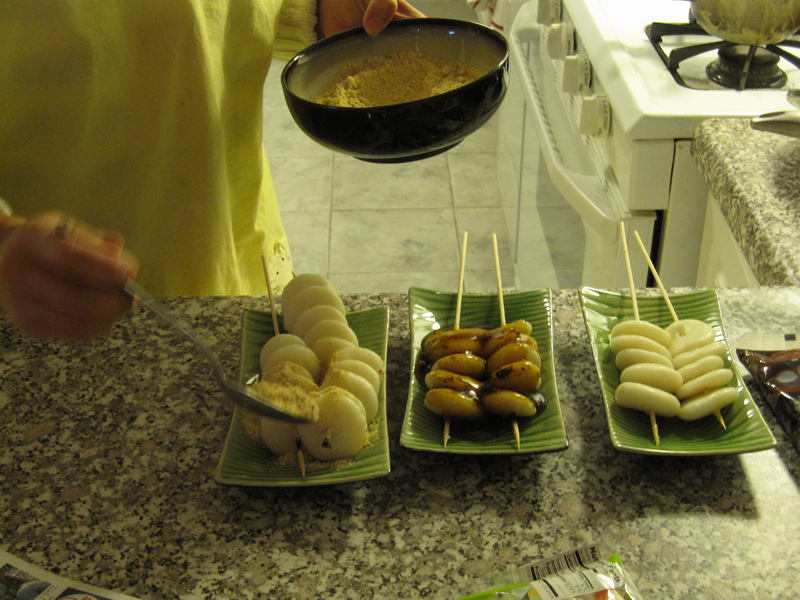 Yuki requested a simple, lightly flavored dinner last night, so to please my wife I made a Japanese-style line up of chow. 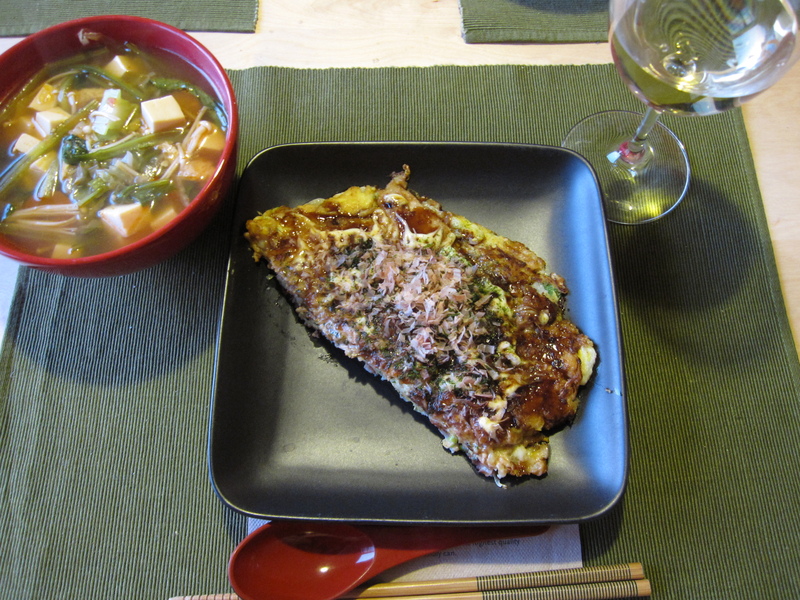 I made Hijiki Rice, Miso Soup, and Pork-stuffed Aburage. For the rice, I made two cups in our rice cooker. I simply washed the rice and added a little less water than necessary to cook it. To get the liquid up to the right amount I topped it off with some soy sauce, no more than about a quarter cup. 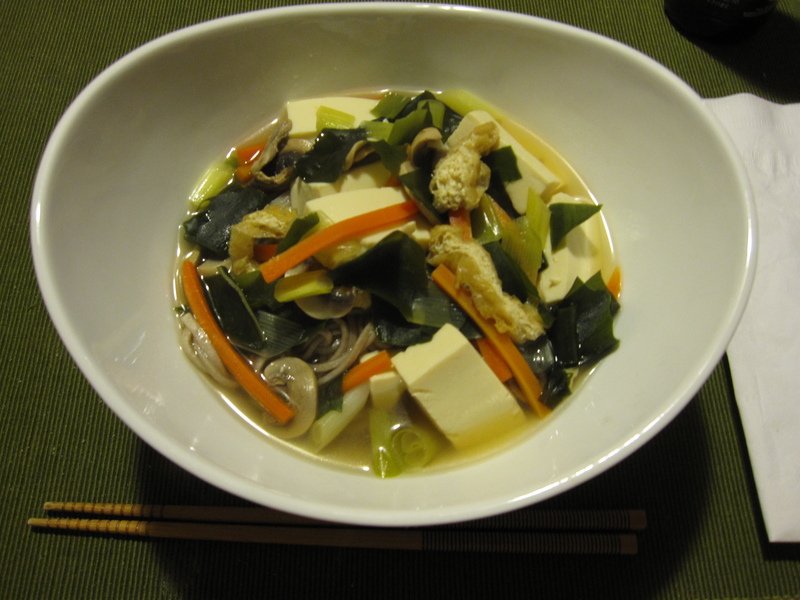 Then I added a couple tablespoons of dried hijiki seaweed (available at more and more groceries), about a half teaspoon of dashi-no-moto (dried, instant dashi, also available at more and more groceries), as well as half of a large carrot diced. That’s it, turn it on and let it cook. 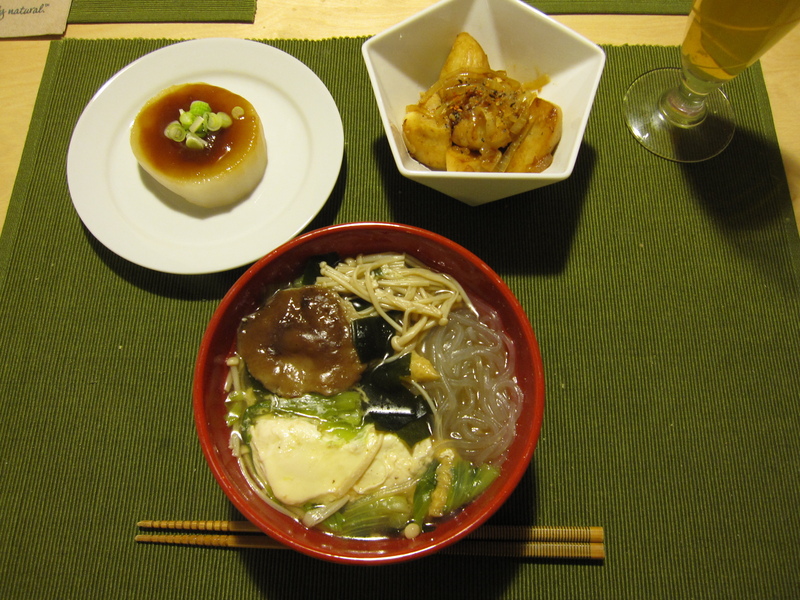 The miso soup was also simple. I brought two and a half cups of water to a boil with 6 green onions chopped to inch-long pieces. Once it started to boil I added 6 baby bok choy and 6 quartered shiitake mushrooms. I let that boil for about 10 minutes, turned off the heat, and added a half teaspoon of dashi-no-moto along with 2 tablespoons of soy sauce. I put that aside until dinner time. Before making everything I cooked up the ground pork. I sautéed a chopped clove of garlic with a half-inch of chopped ginger in some oil for a few minutes. Then I added about a quarter of an onion, small diced, and let that cook for a few minutes. After that I added a half pound of ground pork and cooked that all the way through. Once the pork was mostly cooked I added 1.5 teaspoons of soy sauce, 1 teaspoon of sake, a half teaspoon of mirin, and some black pepper. I let that liquid boil down and then took off the heat to cool. To prepare the aburage I first layed them in a colander, boiled some water, and then dumped the water on them to rinse off the excess oil that they come in. Then I squeezed all of the water off. I took my sharpest knife and carefully slit open one side and then gently used my fingers to open them up. 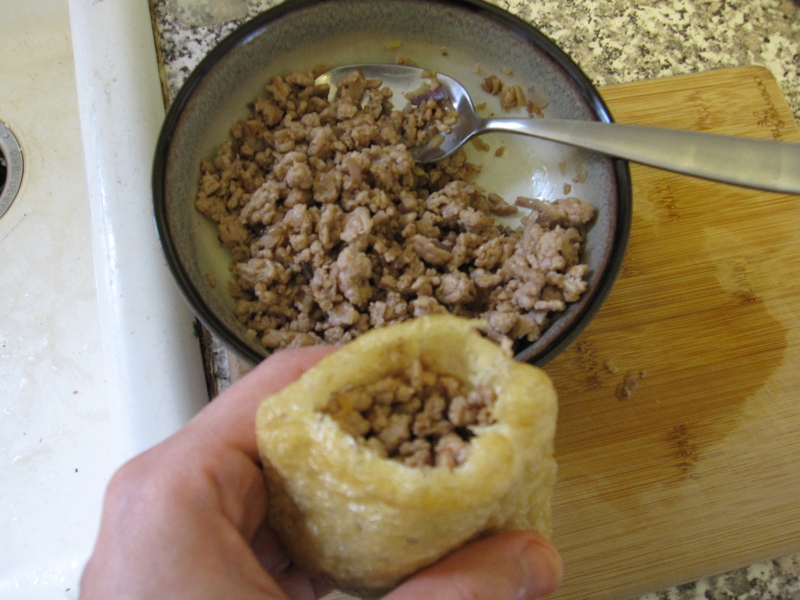 After that I just spooned the ground pork mixture and then set aside. Once the rice was ready I put the soup back on some heat and put the aburage under the broiler. 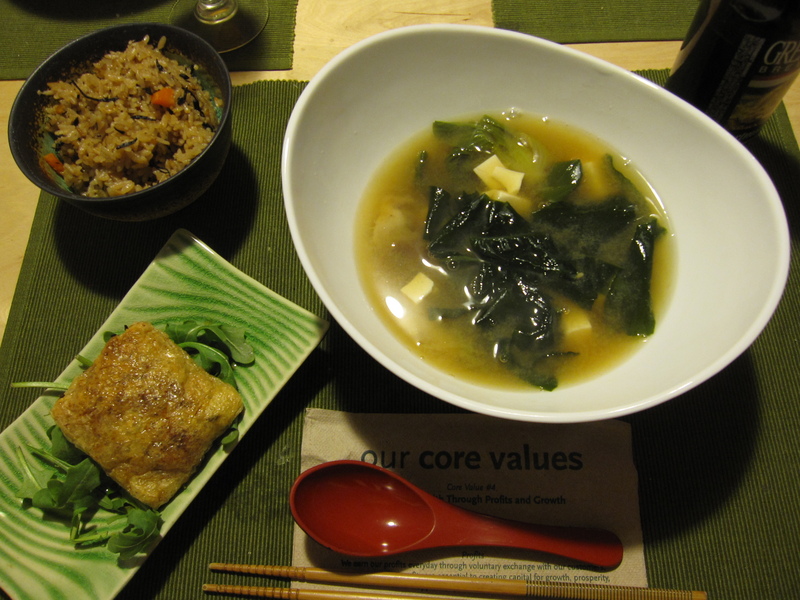 Just before the soup started to boil I added some diced tofu and some wakame seaweed. Then Yuki whisked in a couple tablespoons of miso. When the aburage was heated through, about 5 minutes, I took them out and layed them on beds of arugula and drizzled with ponzu sauce. After eating an entire feedlots’ worth of animal Sunday night we really needed Meatless Monday. We tried to make this one as healthy and simple as possible in order to ease the recent strain put on our tummies. Soba noodles, being about as healthy as you can get in the way of carbs, seemed like a good route to go. 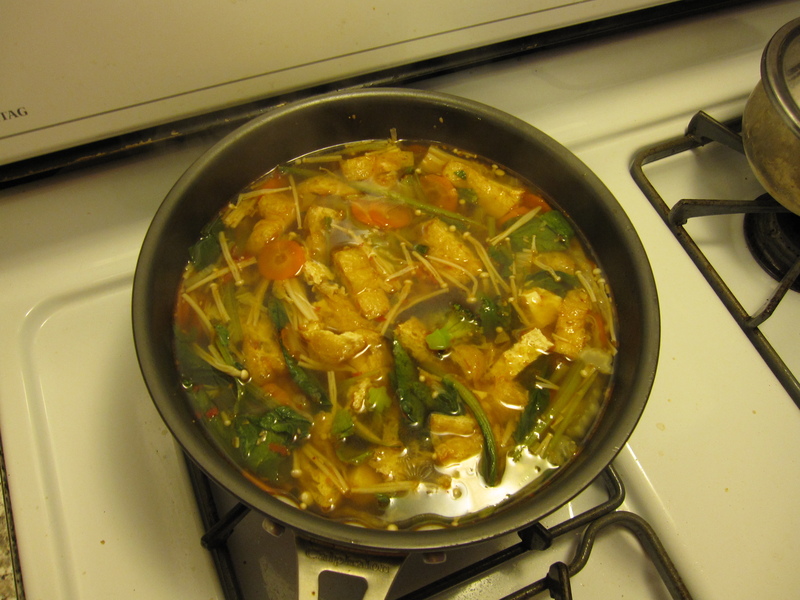 For this one we cut up some green onions, carrots, and mushrooms and added them to some boiling konbu dashi. Once they were cooked a little we added some aburage and dried wakame. It takes the wakame a few minutes to soften. Then we dropped in a block of tofu that was cut into smaller pieces. To put it together we simply put cooked soba noodles in the bottom of our bowls then ladled the broth and veggies on top. A dash of togarashi, a beer, and you’ve got a light, healthy, satisfying dinner.